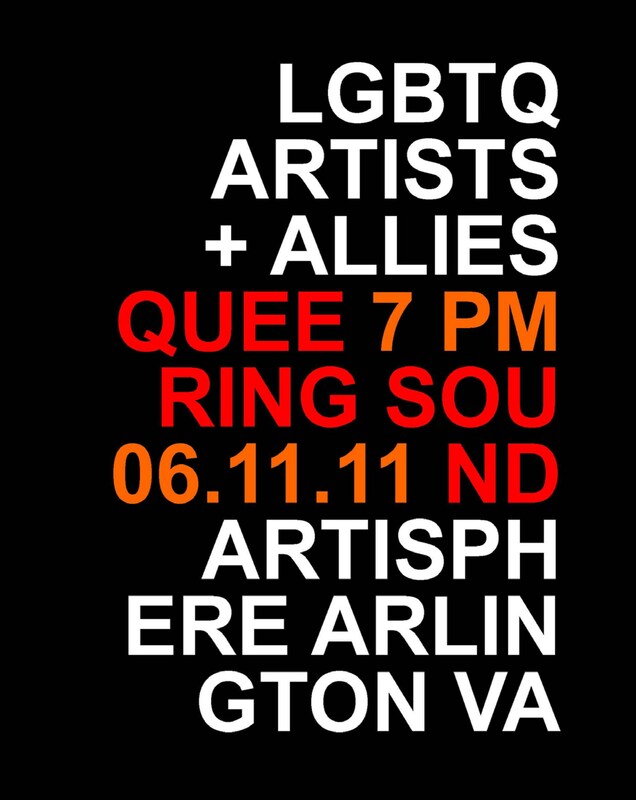 The eleventh installment of Queering Sound again gathers together artists - with a non-exclusive curatorial focus towards gay, lesbian and post-gender-identified participants - who explore alternative avenues of expression through audio, the digital arts, performance art and spoken word. The annual event features live performances from established and upcoming local talents as well as seeks to introduce Washington audiences to new sounds and challenging visions from across the globe through digital contributions. Compact discs, recordings, publications and other merchandise from contributors will be available for sale. Admission is $10.00 and available at the door and online. BLK w/ BEAR is a full-band effort of JS Adams (prepared vinyl + turntables + loops), Doug Poplin (cello + effects), PD Sexton (bass + source electronics + effects) and now Renee Shaw (video), whose recordings of warm drones and broadcast interference have accompanied film/video projects in NYC and London, as well as BBC and Sun television programming; as well as in the Discovery's Channel's Emmy-nominated 'The Flight that Fought Back' production; broadcast in the USA, UK, Russia, Japan and Germany. BLK w/ BEAR's newest recordings include the forthcoming Yonokiero remix project, Sorry about your Remix, on Front & Follow (UK) and a split CD with Nine Strings on Cohort Recordings (USA). The band.s back catalogue is available on Sonic Circuits. District of Noise imprint (USA), Trace Recordings (UK), Front & Follow, and Ultra Red.s Public Record download label (USA). Poplin also performs as part of the Bach Sinfonia and Sad Emoticon with Rich Morel; Adams is a nationally-exhibited visual artist and part of the turntable-deconstruction duo VLT_BLK and STYLUS turntable ensemble; Reneé Shaw is an installation and performance artist; under her VJ POPPINS persona, she manipulates video output through live, spontaneous editing; and Sexton also performs as a solo artist. THE NEW GAY (TNG) is an online resource for alternative queer events, culture and ideas. TNG is a blog for those frustrated with monolithic queer culture and it's limited offerings and strives to provide our readers with access to the rest of the queer experience. TNG is home to everyone over the rainbow whether you are LGBTQ or don't quite fit in a box. The TRIANGLE ARTISTS GROUP is an affiliation of lesbian, gay, bisexual, and queer artisans from throughout the Washington-Baltimore area and covers a wide spectrum of visual, literary, and performance arts. SONIC CIRCUITS seeks to foster the spirit of collaboration through the diversity of participating artists, and its varied programming appeals to arts enthusiasts of all type; offering experimental and avant-garde electronic music to free jazz, noise rock, modern composition, avant-garde improvisation, electronic drone and experimental folk, as well as live video and film programs, presented year round. The 2011 Sonic Circuits festival is scheduled for September 16-18 at Pyramid Atlantic, Silver Spring, Maryland. ARTISPHERE is a new breed of urban arts center that features four distinct performance venues, three visual art galleries, a 4,000 square foot ballroom, HERE restaurant and a free Wi-Fi town square. With intimate co-located spaces and multiple programs occurring simultaneously, Artisphere was designed for people and art to collide. Its unique footprint encourages visitors coming for a familiar activity to try something new. Artisphere is managed by Arlington County's Cultural Affairs Division and supported in part by the Rosslyn BID, individuals, corporations and foundations.